Adriana Flores next to her outdoor cupboard stocked with donated feminine products. Photo courtesy of the Lansing State Journal. Cheers to the Lansing State Journal in Michigan for their article on National Association of Social Workers member Adriana Flores. 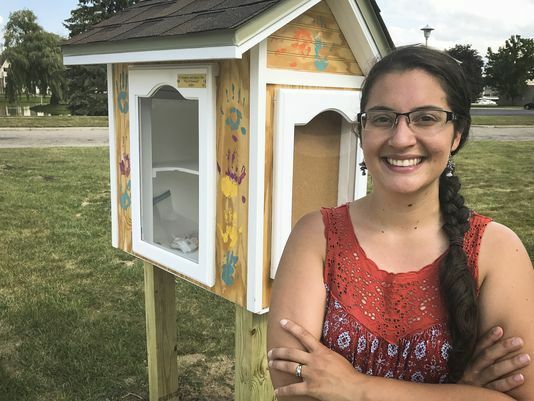 Many people are setting up outsdoor cupboards, or “free little libraries,” to share books with children. However, Flores decided to do a twist on this craze to help women who are low income who live in the Edgewood Village housing complex in Meridian Township. Instead of stocking the cupboards with books Flores puts donated tampons, pads and other personal items. These items are expensive and many women who are low income have to choose between buying them or putting food on the table for their families. Great idea, Adriana. Who knows… you could start your own non-profit along this specific area of focus. LFL works well for books, but the idea is limitless. For one of my Community Building and Engagement projects for my MSW internship, we’re building Free Little Libraries – bigger project than I actually imagined, but still worthwhile. For the sites that already have an informal drop-off point – eg food, we had a consideration for attaching a donations box to the library. Of course, it’s always location sensitive, but the concept of the LFL can really be tailored as appropriate and expand as needed.